Luxury Sailing yacht ATHENA is a remarkable superyacht and at 295 feet overall (90 meters), ATHENA is the largest private sailing yacht of the modern era and the largest all-aluminum yacht built to date. She is built entirely of high tensile Alustar and she is a giant which displaces a staggering 1,177 tons. Not only is she the largest but she has been created to the highest standards of traditional craftsmanship whilst incorporating inspiring technical achievement. ATHENA’s three masts soar 197 feet above the deck supporting 28,632 square feet of sail. Her beauty is obvious, but Athena is also the sort of marvel we have come to expect from Royal Huisman and the myriad Dutch industries pressed into service to ensure her timely delivery while meeting the owner's demand for the highest quality. ATHENA’s interior design is by Rebecca Bradley, her bridge Deck featuring open air lounge, media lounge, lobby and powder room. Her main deck with formal dining salon, library, main salon with wet bar and an alfresco dining area. She also features roomy foyers, hallways and satellite seating areas. ATHENA was awarded the "Show Boats International" Award for "Best Sailing Yacht over 40 Meters for 2004" as awarded in Monaco in June 2005. ATHENA was also nominated also for "Show Boats International" awards for the "Highest Technical achievement in a sailing yacht" and "Best Sailing Yacht Interior". 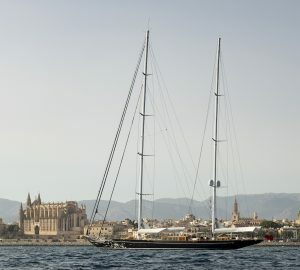 She also holds a prestigious award by KNVTS Royal Huisman Shipyard and ATHENA was recognized by the Royal Dutch Corporation for Shipping Technicians. ATHENA was the last yacht to slide down the ways before Wolter Huisman’s death, she also pays homage to a man whose name is synonymous with the best in yacht building. Sailing Yacht ATHENA provides guests with the following accommodation for up to 10 in 5 cabins: The lower deck is comprised of the full width master cabin with full width master bath with Spa Pool, the Owner’s Office, walk-in wardrobe, 3 x Queen – sized Cabins, 1 x Twin Cabin, the crew area and a diving platform. 2 x 9m Nautica RIB’s, SCUBA gear, Snorkeling equipment, Water Skis, Knee Boards, Wake Boards, Ringos, Kite-Surfing. Audio Visual Equipment and Deck Facilities: Computer based entertainment system from SeaScape “Emotion”, 400 movies on demand, 2500 cd’s on demand. Communications: Internal communication ‘Voice over IP’ (Avaya), Inmarsat-C (Sailor), Navtex (Furuno), SSB transceiver (Sailor), 3x VHF’s (Sailor), 3x GSM’s (Ericsson), 2x Iridium satellite telephones (Sailor), 2x Inmarsat Fleet 77 systems (Thrane & Thrane), 2x Satellite TV antenna systems (Orbit). Please note that this luxury yacht is a superyacht which has been written about because it is a new or significant yacht which is of interest to our readers. The yacht information above is for informational purposes only and she may not be available for charter.